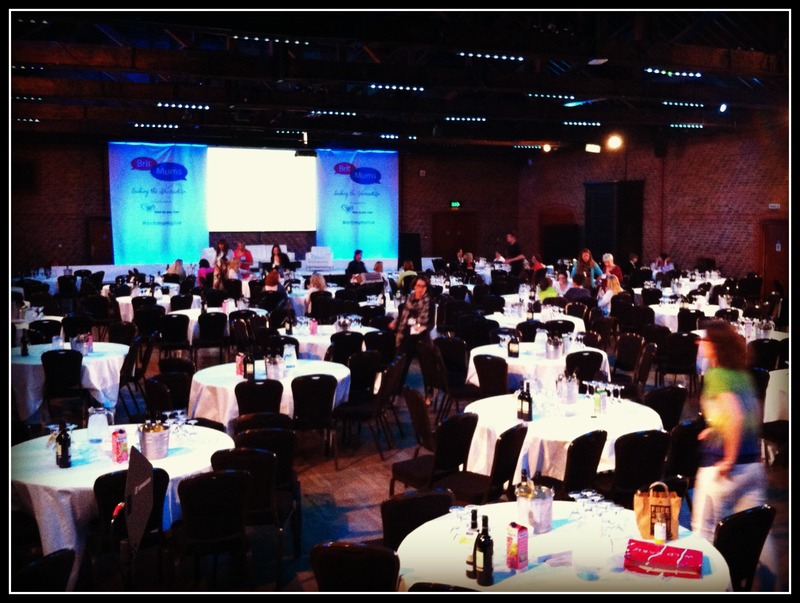 I always find it useful taking a day or two to reflect on a new experience before writing about it, and this weekend – BritMums Live and the Brilliance in Blogging Awards – is no exception. The post I can write today is a lot more measured than the post I would have written on Friday night. Friday was the BiB Awards, and I will confess to finding the event totally overwhelming and not a lot of fun. I headed into London late Friday afternoon with friend and fellow nominee Emily (The Start up Wife). We had a lovely walk from the station to the venue – although we were so busy chatting that we didn’t pay enough attention to the map and took a much longer route than we needed to. It led us through some funky and interesting parts of London though, and gave Emily the chance to take some photos. Some parts of the evening were lovely. Some big name bloggers who I’m a fan of – Kate Takes 5 and Michelle Twin Mum – came over for a chat and were both incredibly friendly and down to earth. I had a lot of lovely compliments about my dress, which had been provided by White Stuff, and a few people even recognised me because of it, saying they had seen my What I’m Wearing post earlier in the week! I was delighted to see Emily win the Snap Category, and also to see Lisa from Mummy Whisperer (another St Albans blogger) win the Inspire Category. It was a real honour to be a finalist in the Fresh Voice category myself, but I had no expectations of winning – it was only ever going to go to one person – and I could not be happier for the mighty Mammasaurus who has done so much to foster a sense of community in the year that she has been blogging. But arriving just for the BiBs after the majority of other bloggers had been there for the afternoon of the conference made it feel like I never quite caught up; the sheer number of people and the noise levels made it very difficult to have proper conversations with fellow bloggers, who had already established themselves in tight groups. Drinks were served by ‘Wine Buffs’ – waiters dressed in little more than their pants, with slogans scrawled across their chests in body paint. I am no prude, but I don’t think they were a good addition to the evening. They made me feel extremely awkward and uncomfortable, and I was astonished to hear some bloggers – the very same ones who would have a hissy fit if there were scantily clad women serving drinks at an event – directing some pretty lewd and crude comments at them. In all, I think the combination of the free-flowing Prosecco and the competition element of the evening brought out the worst in some people, and after I saw one BiBs winner being subjected to some pretty catty comments in the toilets after winning her award, I decided it was time to head home. After a not-very-awesome start to the weekend, I can’t say I was much looking forward to the Saturday. Again, I was going to be showing up late. The Saturday morning pancake and bacon routine in the DorkyHouse is so enshrined that I wasn’t prepared to miss it, even to see Sarah Brown speak. 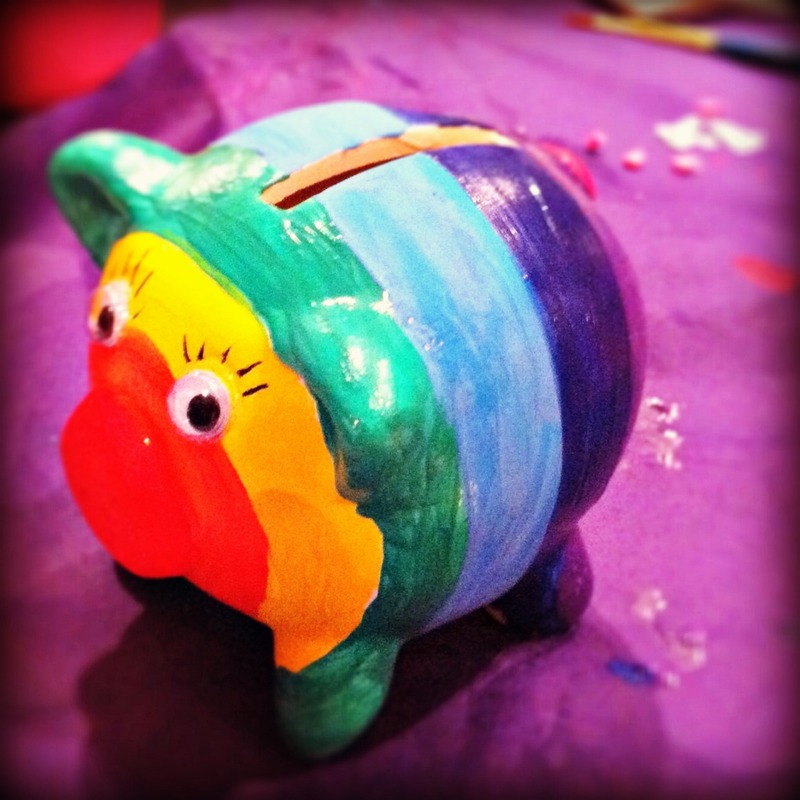 However, when I did arrive at the venue just before lunchtime, the Piggy Bank Kids stall was the first place I headed, where I had a good chat with their Projects Assistant Charlie, and made my very own Piggy Bank for DorkySon. The work they do is amazing, especially with such a small team, and I’m looking forward to staying in touch with them. Shortly after that, I met up with Chloe from Cookiejar Life and it was really nice having someone to chum me for the rest of the afternoon. We grabbed some lunch and had a quick browse of the sponsor stalls, but there were no brands there that I really felt a connection with, so we didn’t loiter. I had intentionally chosen sessions that focused more on the writing side of blogging than the promotional or commercial side. Sod The Stats: Blogging for Happiness was an excellent discussion den, with lots of honesty and emotion both from the speakers on the platform and from the attendees. Beyond Blogging: Writing About Your Life by Andrea Stuart from the Faber Academy was also interesting, but probably aimed at people further on in their thinking than I am. So how to sum up? I have to acknowledge the incredible amount of work that must have gone in to organising the conference. Huge thanks are due to Michelle, Susanna, Jennifer, Karin and everyone else at BritMums. I hope they are all taking it easy this week. On balance, I’m glad I went and I’ve taken some valuable lessons away from the experience. The Blogger Keynotes, the Blogging for Happiness session, and a lovely, lovely chat with Cherry Healey have reminded me of the best bits about blogging. If you are prepared to put the effort into producing strong writing then you can create genuine connections with people. That for me is a far more important reward than high monthly stats or rankings, so I think it has given me the confidence to blog less, but blog better. The swag bags and the sponsor stalls are all harmless enough, I suppose, but it’s not really what I’m about. I have only recently started to receive PR offers that are even halfway appealing, so I’ve said yes to a couple of things to see how it feels – and the conference has reinforced what I’d already decided. I don’t want to do many reviews on my blog. It doesn’t sit right with me. If I write about a company I want that to be because I love them anyway, not just because they’re providing me with products to test. It would be great to find one brand that I felt a connection with in the same way that I have one charity I feel a connection with. But the dribs and drabs – a craft box here and a photo book there – is not really for me. Similarly, I will stick with promoting my blog on Facebook and Twitter, because I have fun on those two sites anyway, but I’m not going to join Pinterest or Google+ just to try and add a few zeros onto the end of my monthly page views. I’d rather spend that time coming up with ideas for posts, I think. Everyone had said before the conference that the best bit about it would be meeting other bloggers, and in a way that is true – I met a few really interesting and sweet and funny people. But I think my desire for a ‘genuine’ blog experience also extends to the way I’d like to forge friendships with other bloggers. I already have a few brilliant friends that I have made through blogging – but they are all based on pre-existing connections. Maybe we support the same charity, or maybe we live in the same town, or maybe we have something else in common… I would like to have more blogger friends, but I think I would like those friendships to happen organically – because I have connected with someone’s writing rather than because I happen to have sat next to them at a conference. I’m really glad I went. It has reminded me of the important things about blogging. I’m just not sure that the important things – for me – include conferences. A year is a long time to think about this, so by next June I may well have changed my mind, but right now I’m not feeling like BritMums Live is my natural or most comfortable territory, and I don’t think I’ll be going again. Well, I am about to do a whole series on my ‘mixed feelings’. What an absolute relief to hear someone else being less than positive, an REAL about their BritMumsLive experience. The idea of “wine buffs” really makes my stomach turn and surely just trivialises what so many women work hard to achieve??? People’s thoughts and feelings about Britmums Live are starting to flood my reader today, which I was expecting. It’s encouraging to see that people who didn’t enjoy every aspect of the event are happily writing about it. The honesty of bloggers on display! Kudos to Britmums also for still encouraging the writers of less positive views to add them to their linky for Britmums posts. I couldn’t go this year, though I’d have liked to. For me it would have been more about meeting the writers of blogs I enjoy, yours included. Maybe that is something which could be achieved more easily in other ways, Tweet-ups etc. Regardless, I’m pretty sure I’ll give it a go next year, as long as enough other people intend to be there too. I agree with that – I think BritMums are genuinely open to feedback and constructive criticism, and it’s great that they are getting such a range of very honest views. I don’t doubt they’ll take it all on board and use it to make improvements BML2013. One of the suggestions I’ve already made is to start on the Fri morning & have it just for bloggers to meet each other informally, with no workshops. Although you’d maybe have to do something similar for an hour on Sat morning too, otherwise the people that can only make it for one day will find it even harder to break into the established groups. I sail through life as Pollyanna, and it upsets me when I hear of cattiness. I didn’t win my award. I said to the beautiful Lisa hours before the ceremony ” and the winner is The Mummy Whisperer” and was delighted when she won. Cyberspace is huge and there’s a place for us all. I do hope by next year you reconsider. I am gutted we didn’t get to meet up, but hopefully next time somewhere around the ridges we will do! I was in the same position on Friday evening – and couldn’t accommodate Saturday as family came first. I’m delighted for Lisa, Annie and Ben for their awards – but I found the inability of so many to just offer a basic courteous “hello, who are you” quite baffling – in a saddening way. I never believed I had a hope of winning my section (and indeed still wonder quite how I ended up in there) but was hoping to chat to a few more people – instead it was a bit of a blur of alcohol and lack of food. On the positives, I had a lovely dinner with some other St Albans folk plus the amazing Hayley from Downssideup – that most, definitely was the highlight for me. we had dinner with Hayley – I didn’t hear her read, just nattered over dinner. We found a nigh on empty wagamammas in centre point and scoffed away! Hi DorkyMum, it was really lovely to see you again and I’m sorry we did not get the chance to talk more after the BiBs – I had to dash straight off on both nights so missed out on a lot of the socialising aspect. Sarah Brown’s speech and meeting her afterwards made my weekend and I too really enjoyed the Blogging for Happiness session. I was on my own a lot of Sat too and probably would have ducked out a bit earlier, had I not had to get up and speak at the end!! TERRIFYING. Great to read your point of view. We went to the MADs last year (haven’t had the time or money to do anything this year) and it was great to put some faces to names and feel like we were part of something. But it’s a huge undertaking to get down to London from Scotland – when we have five kids to organise and it’s necessary to throw quite a bit of money at the weekend. I’d love to do one conference sometime, just to experience it. You either connect or you don’t. And meeting at conferences rarely forges firm friendships. Shame people couldn’t all be happy for each other, and you had to witness some bitchiness. That’s why, when it comes to getting together with other women, I prefer quality, rather than quantity. Yes, it’s a bit epic to get down isn’t it? I suppose it depends what kind of event you feel comfortable at, but if I were in your position and had to make a choice I’d probably try and make it down for one of the charity blogger conferences, where it’s a more manageable size and you still get some helpful blog advice, but it’s also a lot more focused and everyone feels more united. It was great to finally meet you (as it was to meet Cheetahs!) but I know exactly what you mean. I veer between two extremes, either extremely garrulous and exceptionally stand offish. Fortunately it was the former that took to the fore on friday night rather than the latter and I had a great time catching up with everyone. Even if I was just there for the BiBs rather than the whole conference. Very glad I got you on a good night then! How did you feel about the Wine Buffs?! Bless you, what a lovely comment, thank you so much! We all hope we’ve got a book in us, don’t we…?! I don’t imagine for a minute your blog is rubbish, I’m off for a nosey…! I am kind of glad that I missed the Friday. I’ve not heard many people say positive things about it. The cattiness is such a shame, I hope the poor BiBs winner was nowhere within earshot. It would have been really nice to meet you! Like you, I only came for the awards party and was terrified. And like you I was dismayed by the waiters, a concept more akin to a low-life hen party than an awards. But, despite my nerves, I was luckier. I didn’t meet many, because time was so short and the crowd so huge, but I sought out my particular heroes, including you, and found them all delightful. In fact it changed my view of the blog and twittersphere which I’d always assumed fun but superficial. Happily I didn’t experience the loos or else I’d have been disillusioned. I don’t doubt there are many disagreeable personalities in blogdom, but so far, touch wood, they’ve yet to cross my path. Hope you cross it again soon though! This was such a good post. My experience of Britmums was largely positive, and is reflected in the post I’ve written about it. I think this is because I’d already organised some blogging buddies for the weekend and I hung onto them all weekend. This made a huge difference to the event. I think I would have felt terrified if I’d gone on my own or had arrived on the Saturday evening. The whole thing was overwhelming. I am very glad I got to meet you though, just wished we could have spoken for longer. I’ve always admired your blog and writing. Still at least I got to say a hello. I did feel rather shy for most of the weekend though – blogging buddies and wine came in handy. Your reading at the end was wonderful – that was my favourite part of the whole thing, the bloggers key note! So pleased to have met you at the conference!!! And of course, pleased to hear you read 🙂 One of the reasons I like working on the hectic registration desk is so I can start to put faces and names together but of course I have to realise I can never see everyone. It’s just my little method at attempting to overcome that hurdle. I LOVE that idea of a mingling period and someone else suggested something like ‘speed dating’ but with business cards and a quick chat about blogs–perhaps a mix of the two? It will be interesting to see what they come up with next year! I didn’t realise there had been cattiness but my head was spinning with trying to get the BiBs stuff organised so perhaps I was only seeing the happy excited people! I did hear one comment re the ‘wine buffs’, though. I know there was a LOT of discussion on that before the conference and I think it ended up being a case of ‘well, lets try it and see, and if it doesn’t work out then we’ll know for next year!’ I heard one woman telling a wine buff they shouldn’t be there, that they were being objectified and he chuckled and said ‘well, I work hard on this body, I don’t have a problem showing it off AND I get paid for it!’ So I supposed there’s always different points of view on a thing. Thanks for taking the time to comment Michelle – lovely to meet you too 🙂 And I can’t believe you’re back online already rather than lying down in a darkened room somewhere… I hope you at least had a nice chilled day yesterday! I think the speed networking idea for next year will work really well. It still won’t be possible to meet everyone, but if every blogger had the opportunity to chat with even a dozen or so others early on, I think it’d help those people who find it all a bit intimidating (like, erm, me!). Reading blogs and tweets today, I’ve seen a lot of mixed opinion on the Wine Buffs – some people loved them and others really didn’t, so I guess you’ll never please us all. What’s good is how open you all are being to the feedback. I think the other thing to bear in mind when you’re reading all these very honest posts is the range of characters/interests/personalities in the blog community – and no matter what you do and how you tailor the conference, there will still be some people who feel it just isn’t for them. So I hope you take any criticism in the constructive way in which it is intended. I think all constructive criticism is a GREAT thing–it is the best way anyone has of learning how to improve!! One thing that has impressed me about working with Jen and Susanna is the genuine desire to create the best experience they can for the blogging community. They don’t pay me to say that! It’s true. That’s their driver. I know they are very keen to learn what to do differently next time, and what to keep the same. You are delightful and I thoroughly appreciate your honest and thoughtful commentary on the event. I’m sorry it wasn’t everything you were hoping (?) it would be but I am so pleased that you were able to take away some good things. Your reading was wonderful and I am so happy to have finally met you in person. I hope we’ll be able to chat more throughout the year…you’ve been a real source of support and encouragement to me this year so thank you so much for that too! Goodness, our posts are very similar indeed! I am absolutely gutted that we didn’t manage to meet up because you were right at the top of my list. I’m not good in large crowds of people and I’m useless at leaping on people and asking them who they are which means I missed out on meeting a fair few I would have liked to. It was totally overwhelming but with that number of people who didn’t really know each other I guess that is quite hard to avoid! Love your balanced post – I was definitely with you on the waiters – I hovered down in the main hall childminding lots of iphones being charged! Would loved to have met you, maybe next year? Definitely would love some speed networking, and more time to chat to others also feeling lost. There were some people chatting on Facebook last night about the best way to do ‘speed networking’ because it would be almost impossible to do one-on-one. The noise and logistics would be a nightmare. I used to work for an NGO where we had lots of very nervous volunteers who wanted to lobby MPs but were too nervous to make individual appointments, so our solution was a speed lobbying event where we sat 12 MPs down at tables and let six volunteers at a time circulate from table to table. I can see that working at a blogging conference if you had a room with x number of experienced/confident bloggers to host a table, and groups of 6-10 newer or shyer bloggers circulating around them for 5 mins at a time. So everyone gets a wee chat with some new folk on a similar experience level who may turn into friends, but also gets a quick chat with lots of ‘top’ bloggers who can hopefully be friendly and pass on some wisdom. It wouldn’t be everyone’s cup of tea, but it might be a nice ice breaker for those that were interested. I only crossed paths with you very briefly and would have loved to spend more time that’s one of the problems of these events that’s hard to master. I was also in working mode too and lived the BML from the other side so to speak. I knew from the offset that the #winebuffs would be Love/Hate, it didn’t bother me as I saw it as a bit of light hearted fun and certainly not degrading but you can’t please everyone and fortunately we aren’t all the same otherwise it would be a very boring world indeed. I’m saddened to hear their was cattiness regarding a winner but again, that’s life isn’t it? You’ll never please everyone, I prefer to rejoice their achievements – all of them and be proud of being part of such an inspiring crowd. Hi! I am really really new in the blogging world, ie it started in May! I have blogged for business but that is completely different really. Anyway I was there with a very good friend of mine, but she couldn’t get there until the awards part so I spent Friday afternoon by myself. I went expecting the butterflies to be immediately visible to help me over the not knowing anyone, disappointingly this was not the case, so I quickly decided I was happy to be by myself really. I was happy chatting to the sponsors and pleasing myself. Both my friend and I were not fussed with the Winebuffs, (I’m currently pregnant so not drinking anyway) and we were a little disappointed with the awards. But we really enjoyed the saturday and I loved some of the products available because I know how much fun we as a family will have with them (whether the sponsors wanted me to review them or not!) On saturday I got to meet a couple of the bloggers that I have met via twitter and Love New Blogs and that was definitely a highlight, as were the keynote bloggers because it has opened me up to even more blogs – such as yours! So as terrifying as it was for me on Friday afternoon I still came away having caught up with a brilliant friend, and enjoying myself! I think from having spent many times at networking and business events I have learnt to go and concentrate on the things I like and enjoy and not to get overly involved with ‘clicky’ groups as they are notoriously unkind when they want to be. I will definitely be coming back to read your blog though because I enjoyed your keynote and found this review of the weekend really refreshing and honest! I love this post. Even when you are just writing a review of a blogging conference, you write in such an engaging way. The Fresh Voice category was a very tough one, but I am really hoping you win big at the MADs. A lot of what you’ve written resonates with me. I wasn’t there for the conference, but the things you’ve described are some of the same things that had me hesistating at buying a ticket. The awards bit was lovely all in all, although it was all over just as I had enough confidence (and prosecco!) to start warming up to the idea of walking over to people I recognised. Nerves weren’t helped by the fact that the majority of people had been there for several hours beforehand at the conference and already formed groups, but then I expected that and it’s perfectly natural for things to happen that way. Big shame about the catty comments. I am glad to say that I didn’t witness anything like that – it was lovely to see so many people genuinely pleased for the award winners . I love the idea of speed-networking at the beginning of a conference. Bit daunting, but it would be great to get people talking. Thank you for the kind mention. I was very pleased to meet you and hopefully we can do it again and have a proper chat. Equally, one of the best bits was walking past a very packed and noisy All Bar One and finding a quiet curry house with four other bloggers I’d met for for the first time but knew on line. We had a lovely evening. So it wasn’t a Britmumslive thing, but one that wouldn’t have happened if I wasn’t there, if you see what I mean. I really enjoyed reading this and it was reassuring to hear of your similar thoughts on it to mine. I really didn’t enjoy the Friday evening and was shocked by some of the behaviour displayed at the end by people attending. I enjoyed going and meeting people, there were some really lovely people (including you!) but I think if I went again I wouldn’t go out afterwards for the drinking part as it was way out of my comfort zone. I initially felt like I wouldn’t go again but stepping back I probably would, but I would only attend certain bits. On the Friday night I had an evening just with my “roomy” and that was lovely and chilled. I don’t know about next year and I don’t know about my blog, but I shared a lot of your views which I think made me go for a photo based report of the event so I could have time to consider it more. I entirely agree about the waiters. They were utterly inappropriate for the conference and I felt incredibly uncomfortable. I’m so sorry that I didn’t get to meet you. Hope we will one day! *shouts* SHE SWIPED BABY WIPES, SHE SWIPED BABY WIPES. Ha, that’s too good. Brilliant post (as per…) My idea of hell is a room full of hundreds of females and I was nervous as hell going along to BML. I did what I’ve done for the last couple of conferences I’ve gone to – STC and Cybher – and connected with some other bloggers to meet up with ahead of going in. There were times when I was on my own and it is always a slightly uneasy feeling when it seems everyone around you is having the time of their lives with all their best friends. But the reality is often – as it turns out from reading some of the follow-up posts – that when you scratch beneath the surface, most of us are all dealing with the same worries and emotions. Cattiness – that just makes my blood boil, really saddened to hear of that. Keynote – as I’ve alluded to on Twitter, I think an event – ideally for charity – based around blogger keynote posts would be a fantastic thing to do. I didn’t experience any negativitiy. Having been before I guess I’d found my comfort zone. You were fab in Saturday. This is a brilliant post and yes I didn’t like the waiters either! It’s refreshing to read this. I’m a new blogger and find the whole stats, conference and awards mentality rather intimidating. I just love writing about me and my baby. Isn’t that really what it’s all about? Ohh I love you, you really are brilliant Ruth. I’ve told you that before, right? You had me chuckling, big name blogger indeed! and you have given me some good food for thought – do I want to invest time in Pinterst etc to gain zeros or use the time wisely and enjoy what I do already. So much to think about in your post so want to revisit it a few times to capture all of it. Cattiness is unforgivable. First I have heard of this and am appalled. 1. BritMums are always keen to hear feedback and I find them very responsive to it. 2. I wish I had met you and had time to chat. I think it was a bit odd for me as have gone from blogging obscurity to being speaker and BritMums team member so was not quite sure how to play it and was wracked by the usual shyness that I know can come across as standoffish. 3. Your keynote was marvellous and so very well observed. 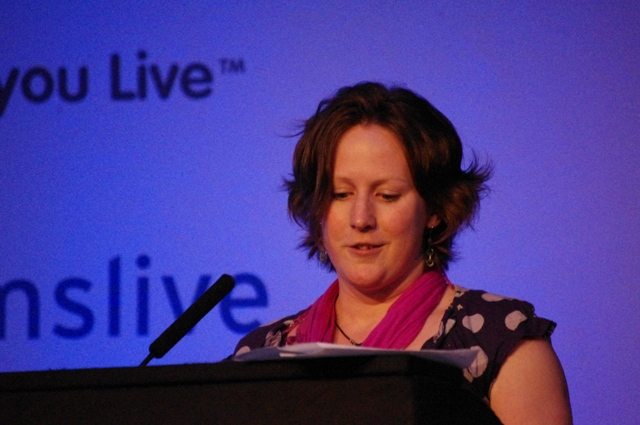 Bri my partner, was one of only a handful of intimidated men amongst 500 women at Britmums Live. I’m not sure he felt the waiters balanced out the sexes, but I get your, if the shoe was on the other foot, point – would it be acceptable? I am a newbie (May 2012) to this all-consuming blogging world and blown away by this exciting community – I thus far knew nothing of. Bri is helping me with the technical minfield that is setting up a blog; so it seemed to make more sense him going. He came back buzzing about keywords, links and talk of something called Pinterest. But like a weary traveller from exotic lands (well we are in Wales) he returned with a bag full of goodies. I know you won’t approve – but Bigger boy got an atlas, which I was delighted with and also a couple of Skylanders (Xbox game with mini monsters) which he was delighted with. Littler boy got some colouring in things and a couple of books. While I lucked out with body lotion, hand cream, some snazzy lolly makers and a pretty mouse mat; things I have used every day since. Look forward to giving you an almighty round of applause at next year’s awards!